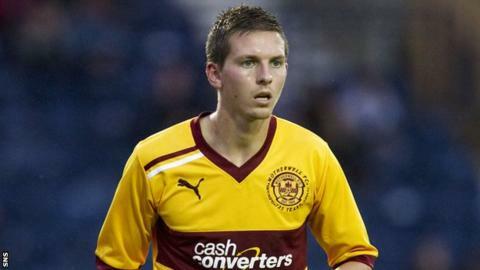 Scotland cap Steven Saunders hopes to make his mark again with Motherwell before his contract expires at the end of the season. The 21-year-old had knee surgery in August and says he is still on target for a Christmas return to action. "I need to get back and play games obviously before my contract is out and get back to the form I had before I got injured," said the 21-year-old. "I'm progressing very well, I have started running again." The injury followed a season ruined by a ruptured Achilles tendon, which he suffered while playing for Scotland Under-21s 14 months ago. Saunders only made one stoppage-time substitute appearance before last season ended and his comeback was cut short by a separate problem. "I was told Christmas by the surgeon and the physio said that's a realistic target," said the defender, who has one Scotland cap. "Obviously it's just jogging just now, but I go and see the surgeon again in a couple of weeks and hopefully I get the all-clear to up the running and the rehab. "But everything is going really well so far, although I don't really set targets because you can get disheartened if you don't hit it on what you expect." Saunders has missed Motherwell's third-placed finish in the Scottish Premier League and subsequent Champions League and Europa League adventures and admitted he has had to be mentally strong to cope. "You go in every day and see the boys and they have a bit of a laugh with you as well. You need that," he said. "You need a good bit of mental strength as well, you need people around you. "The club have been brilliant with me as well, they have made sure everything has gone well and, if I ever need to do anything outside the club, they have helped me. "Obviously the mental strength part of it was the toughest, but I have come back and think I have done all right, so I am getting there. "It's been hard because the team have done very well in the last couple of years and not to be a part of it is very disappointing."